During my school days in the eighties there was a lot of Russian literature that I had easy access to courtesy Progress Publishers and one of my uncles. My uncle is an avid reader and those days his library was flush with Pushkin, Gogol, Tolstoy, Chekhov and also innumerable folk tales from Russia. Some 5-odd first cousins and I grew up in a small hill town surrounded by Russian folk tales. Aldar Kose and Shigai-Bai were household names and we were all too familiar with the laziness and the charm of the youngest son Ivan. The first time I read ‘Misery’ by Anton Chekhov it was a Hindi translation called Vyatha Ka Bhar. The story of Iona Potapov, a sledge-driver in Petersburg, takes just over 2000 words to capture crushing grief. Chekhov is brilliant in using the settings of Russian rural life; lived under the weight and silence of snow. The primary purpose of this post is just to provide a link to the story for an interested reader. In ‘Misery’ death ‘came for the father’ but took the son instead; and Chekhov, in the most beautiful manner, captured the stone deafness of the living. The letter is addressed to Zooey and written by his eldest alive brother Buddy Glass and it deals with, among other things, the acting career of the recipient. Salinger gets it so right; it is near impossible to match Chekhov’s talent nuance for nuance, idiosyncrasy for idiosyncrasy. The Wordsworth Classics edition of selected stories of Anton Chekhov carries an introduction by Joe Andrew, Professor of Russian Literature, Keele University, and some information in this piece is distilled from it. 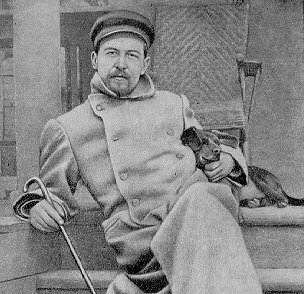 From being a writer partly to earn money to train to be a doctor and partly to amuse himself Chekhov drifted into literature seriously in the mid-1880s when he moved to St. Petersburg and met a number of famous writers who praised the great talent they saw semi-submerged beneath the hackwork. In his work Chekhov combined the dispassionate attitude of a scientist and doctor with the sensitivity and psychological understanding of an artist. Notes: Misery and Grief by Anton Chekhov; Wordsworth Classics, Selected Stories, Anton Chekhov, 1996. Franny and Zooey, J.D. Salinger.